Want to see an overview of UT Arlington Library GIS services this Spring 2006 semester? Here is a draft of a summary I just wrote for our library newsletter, Connections. It sure has been one heck of a semester. Felt like much of the time I was running around like a chicken with its head cut off, but looking back a lot was accomplished. Hello. We are the UT Arlington Library: GIS Services team within the Information Literacy Program Area. We had a most exciting Spring 2006 semester, and want to use this opportunity to show you who we are and what we have been up to this semester. Workshops are our primary outreach mechanism. For folks new to geospatial technologies, these workshops demonstrate how mathematics and statistics are a lot of fun, especially when combined with geospatial technologies. For more experienced folks, we always include a new resource (such as a new dataset) or a new analysis procedure (such as geostatistical analysis). We experimented this semester with broadcasting publicly available webcasts. 16 faculty and students attended these two webcasts and these will definitely continue in the Fall. We began working with numerous new faculty and students this semester, but the main accomplishment is our new relationships with the Criminal Justice department. After previous unsuccessful attempts to build relationships with this department, this semesterÂs workshop, ÂTo Catch a ThiefÂ was incredibly effective. After this workshop, we were invited to provide 4 instruction sessions for 4 criminal justice classes. Hopefully, this is just the beginning. This semester we acquired the entire premium AGS Demographic Dataset for the state of Texas. This provides blockgroup level (app. neighborhood level) demographics for demographics, purchase patterns, crime, environmental factors, personal finance, and other business information. We have been working hard on the geospatial catalog this semester. This summer, we are planning to release a much improved version of our geospatial catalog. This new version will include improved and more complete metadata records, the ability to save and edit searches, and much more. It is not much to look at right now, but the development version can be found here: http://gis.uta.edu/geospat4. In addition to working on GeoSpat (above), we have programmed numerous smaller applications and scripts. Developed a script that will take any GIS map and show you how that map would look during the geologic time period of your choice. This script was developed at the request of the Earth & Environmental Sciences department. We referenced and digitized (vectorized) 11 scanned maps from SPCOÂs map collection. This gives us a total of 24 completed maps. The process of referencing and digitizing these maps enables replications of these maps to be used with geospatial technologies. Over the summer, our students and faculty (and off-campus friends) will be able to interact with these maps within GIS software, Google Earth, and online via mapping applications such as Google/Yahoo! Maps. If you are a Google Earth user, download this KMZ file to view the Colton 1855 map within Google Earth: http://gis.uta.edu/download/kmz/colton1855.kmz. Many more of these coming soon. Joshua Been and Dr. Jose Gutierrez (political science) co-wrote a paper on our collaborative work creating online maps displaying the Hispanic population projections in Texas through 2040. We presented this paper at the American Political Science Association: Teaching & Learning Conference last February. The paper can be found here: here. Want to Keep Up With Our GIS Activities?? Check out the blog, Mapz: A GIS Librarian (http://mapzlibrarian.blogspot.com/). I am getting ready for the last GIS library instruction session this Friday **. This will be the 23rd GIS workshop/instruction session that I held for the library this semester. All of you conspiracy-minded Robert Anton Wilson fans out there should grin at this evidence of the 23 enigma. (I was a college freshman back in '93 when I first read Illuminatus!). Well, yesterday the professor asked me to make sure that I include information regarding AIDS/HIV in the hands-on demo. As is always the case, I had not prepared this data. No worries. I hopped on over to the Texas Department of State Health Services and sure enough they provide HIV/AIDS stats on the county level. In PDF, though... Not enough time to request the datasets from them, so I extracted the PDF tables into Excel. Worked great. Joined the table to a shapefile, and voila...got some great data to share with them. Then, because I simply could not help myself, I created a Google Map and Zoho attribute table. This will definitely peak their interest...and hopefully have them coming back during the summer for more. This is my best hook to get new students excited about GIS. It is entirely web based, uses the Google Maps API, and performs an automated suitability analysis using weighted averages. Plus, it's zany enough to smooth over anyone's anxiety about learning a new technology. There are no domain restrictions, so if you have a spare moment, go ahead and give it a shot. For more information, see my earlier post. This map shows the number of new cases of HIV is Texas in 2004. The attribute table also contains other variables. Demo: Where to Open a New Hospital in the DFW Metroplex & What Services to Offer? This is the real meat of the class. This is a nifty little workshop that allows students new to GIS to explore shapes and attributes, play with symbology, and even run a few analysis procedures (with the help of pre-created Python scripts). ** After Friday, I still have 4 more classes to teach for my adjunct teaching positions. Then I will have a short respite until the summer sessions. "We are seeking a creative, user-oriented professional to serve as Map Librarian and subject liaison for Geography." This really seems like a great job as there appears to be a nice balance between all of the aspects of map/geospatial librarianship. From user consultation, to general reference duties, to FGDC metadata maintenance, to collection development, to outreach, to faculty liaison, and a blending of traditional cartographic materials and geospatial. I see so much potential for this position, and I definitely encourage interested librarians to apply. The minimum requirements include an an MLS which I endorse entirely, as well as "knowledge of map librarianship and the application of GIS services in libraries." The preferred requirements include a "degree in geography or related field and experience using GIS software (ArcGIS)." "planning library services and user education programs related to GIS applications, and coordinating the Libraries' collaboration with other campus GIS service providers"
"providing subject specific reference, consultation, and instruction for users needing assistance with digital and print cartographic and geospatial resources and geography collections"
The minimum salary is set at $ 42,000 which I consider extremely reasonable considering the cost of living in Knoxville. A well qualified applicant may be able to push upwards to $ 50,000. Biology professor needs a 3D map of the US, where the z-values represent particular species richness as opposed to the actual elevation of the terrain. The professor (and her GRA) came during my office hours with a delimited text file containing sample lat/long points along with the associated richness values. Too many. At least 10 hours over the last month. This is my first interaction with this biology professor, and I really, really want the professor to leave with a favorable view of the library's GIS services. I also worked closely with the professor's GRA, and I try to always take advantage of those teachable moments. My first thought was that this would be a super-easy project. Unfortunately, this was not the case. This is probably due to my lack of experience working with the 3D functions of ArcGIS 3D Analyst/ArcGlobe/ArcScene. After this project, this should no longer be the case. Create point feature class from sample data provided by the professor. Obtain U.S. state boundary shapefile from NationalAtlas.gov. Dissolved the continental (48 states) U.S. Converted the dissolved feature class to raster. Interpolated the sample points using kriging with the following parameters: (100 km radius kriging limit / 1 km cell size). The 100 km radius limit was requested by the professor. Merged the kriging layer with the raster U.S. layer. Redefine raster layer as elevation. Exaggerate ArcGlobe by 1000. This was essential as this equated 1 richness factor = 1 km of elevation. Add the states layer, with hollow polygon symbology, to drape on top. Why, develop a workshop of course. Keep your eyes peeled for a good workshop on these techniques planned for Fall 2006 semester. If the professor allows me to use the data points, this might really make some inroads into closer connections with he Biology department. I would have to create a Tin (which is no problem) and then convert the Tin to KML using Arc2Earth. If I can find a free morning this summer (after finals...), I will compare how the elevation renders compared to ArcGlobe. "Please be careful Michael. Current news headlines indicate a recent series of muggings in this neighborhood." You are quick approaching the geotagged photos (adult) of MissKittie69. Click here to view. What we are beginning to see here is a breakdown between the border separating the virtual and the reality. And the critical technology breaking these borders down are geospatial technologies. Remember the news reports of that French guy who crashed his car because he followed his GPS instructions? In this story, the GPS unit was directing the French guy to a hotel and instructed him to make an immediate u-turn. This is a classic case of how spatial technologies enabled virtual information (street network, GPS coordinates, and hotel locations) to direct the actions here in the real world. How far away are we from giving navigation devices actual driving privileges? Not very far at all. Let's take a look at the state of things. More and more virtual materials are being given geotags, which enables these virtuals to be geospatially located. More and more of these geotagged items are being made available via public web services and/or public feeds. Spatial mashups integrating various services/feeds are not a passing fad. Google Earth is set to be integrated with Honda and VW. This deserves its own paragraph. Google Earth is set to be integrated with Honda and VW. Imagine importing Declan Butler's Google Earth Avian Flu KML file. ArcMap scripts can export to KML, as can MapInfo, and Shape2Earth can convert shapefiles to KML without an additional GIS application. Just think of the various geotagged virtuals that can be uploaded/accessed via your in-car navigation system. I can think of no medium or technology that will tear down the boundaries between the virtual and the real more succinctly than geospatial technologies. We are all heading toward a society where geospatially-driven augmented reality will become commonplace. I not only foresee, but I yearn for the day when portable augmented reality systems will allow me to spatially see and interact with geotagged virtual items. 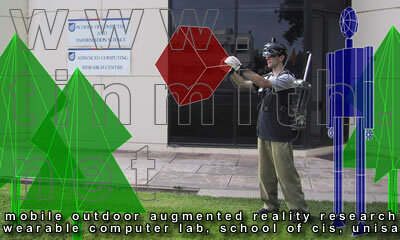 Here are some images from Tinmith Augmented Reality Research to give you more of an idea of what augmented reality is. As I was writing this, however, something that I initially could not put my finger on was bothering me. Something was missing. Now I think I have figured it out. (Isn't it great how writing does this for us?) There is a growing trend to geotag popular and daily consumer items, such as blogs, photos, friends, clubs, even news stories. However, I feel there is a lack of geotagged scholarly resources. Resources such as scholarly journal articles (there are a number of fantastic open source journals out there). Tags can be generated for the author location and more importantly for different geospatial subjects or locations of interest in the article. Scholarly books as well. I want to ensure that when the walls between the virtual and the real come fumbling down, there is a place for the scholarly as well as the popular. Student needed a map of the water wells in Arlington, along with the concentrations of fluoride present in each well. Student has no experience working with GIS. None. Absolutely. The map can be viewed here: http://gis.uta.edu/arcmap2gmap/samples/arlingtonwells.html. The interactive spreadsheet can be viewed here: http://zohosheet.com/view.do?url=http://gis.uta.edu/arcmap2gmap/samples/arlingtonwells.xls. Anyone following this blog knows how much I have enjoyed creating my own customized Google Maps, developed using ArcMap2GMap, and this just gave me an excuse to create another Google Map. But the new (to me) piece of technology I used was Zoho Sheet, a free online spreadsheet application. I exported the shapefile attributes into Excel format, and am using the Zoho API to allow users to view the attributes using Zoho. I love it that users do not need Excel on their computers. I am very impressed with how well Zoho works, even including the ability to create, edit, share, and even to create & include formulas!! For all you tagging junkies, you can even tag your spreadsheets. So, I have been thinking about the applications of online spreadsheets beyond sending information to a single student. I think the potential here for sharing data and data functions with students is quite high. For example, I can create a Zoho Sheet with an illustration of the spreadsheet function necessary to convert DMS to DD. Or, perhaps I can create s sheet with various public attributes. Students then will have the option to download the table as Excel, Open Office, HTML, or PDF. Of course, the tags will allow me to organize the tables which will allow students to access them easier. Ah, well. At the moment this idea will just have to go to the end of my growing list of ideas to explore later. Perhaps this summer I'll be able to explore this a tad bit further. At least I jotted this down here. For those of you familiar with available Texas datasets, the Texas Water Development Board does indeed provide the public ArcIMS-driven WIID System (Water Information Integration & Dissemination), which provides interactive access to Texas wells. However, water quality values, such as fluoride content, is not available via WIID. This data is accessible in the TWDB Groundwater Database. This sounds like an extremely interesting corporate librarian position, with a strong emphasis on Russian and Chinese cartographic materials. "Map Librarian: Mpls. Take charge of corporate Russian/ Chinese specialty map/GIS/ cartographic library of materials in paper, digital, films. Require Master in Library Science or equivalent, courseworks taken in cartography. ArcGIS, database mgmt." It's been 7 months or so since I migrated my blog here from Bloglines, and the cluttered-ness of the layout was really getting to me. So I replaced the old template with a cleaner, fresher model that actually uses the full width of your screen. Much more relaxing around here now, isn't it? There are a couple of places that try hard to serve up a nice hot slice of pizza, but none of them even come close to being great. So...I held a GIS workshop yesterday, entitled 'Where to Open a New Pizzeria in the D/FW Metroplex?' Went better than expected, with 9 students, 2 faculty, and 2 interested staff members attending. "Rutgers University Libraries seeks a librarian to be the primary resource person for the planning and delivery of numeric data services for governmental and non-governmental sources." This appears to be a fantastic opportunity for GIS and other data librarians with a strong interest in the social sciences. This seems to be a trend to include GIS as a subset of the services provided by data librarians. This is a very good thing as the novelty of GIS in and of itself is wearing off and it is taking its rightful place within the realm of data and statistics. No mention of the salary range. Responsible for continued development of Geographic Information Systems (GIS) services including consultation and data acquisition to support teaching and research. Responsible for the development of archival and user support services for numeric data in various electronic formats. Experience...using statistical packages such as SPSS or SAS required. Working knowledge of metadata standards for data such as DDI, Geographic Information Systems software packages such as ArcView and ArcIMS. Haven't posted a new crop of GIS/Geography-related dissertations since January 2006. Here is the latest installment in dissertations that have caught my eye. by Kern, Robert James (R. J. ), M.A., University of Colorado at Boulder, 2005, 156 pages. by Crooks, Valorie A., Ph.D., McMaster University (Canada), 2005, 298 pages. by Cech, Irina, DrPH, The Univ. of Texas H.S.C. at Houston Sch. of Public Health, 2005, 195 pages. by DeGloria, Stephen, PhD, Cornell University, 2006, 152 pages. by Perry, David A., PhD, Oregon State University, 2006, 181 pages. So, you want to be a GIS Librarian, eh? Or, perhaps you are a new GIS Librarian. Possibly you are, as there have been quite a number of available positions lately. There are existing GIS Librarianship-related peer support structures. Remember that you are not alone. There are actually lots of us out there. More than most librarians, GIS librarians need to work very closely with local government agencies, such as city planning departments and local government councils. These are the creators of the datasets that our users will no doubt need, and believe me that it is never the case that everything produced by local government agencies are available for free download. So, what type of involvement are we talking about here? Attending local (off-campus) GIS events, making appointments to visit planners and other GIS professionals, and often times keeping up with series of public information requests. Collaborative efforts, such as joint GIS-Day activities are a great way to start and continue great relationships. Sometimes government agencies might be hesitant to turn some datasets over to the library. It is often necessary to convince them of the policies and procedures that you have set in place (see number 4, below), how authentication is handled, and how it will save them the trouble of having to deal with data requests from individual students or professors on campus. If all datasets are given to the library on a regular basis, no one on campus will need to bother the local government agencies with requests. What (if any) datasets to purchase and where to purchase them? Unfortunately, I know of no survey of essential titles for spatial datasets, but there are some starters available online. How to store and provide access to geospatial data? Learning to operate the basics of GIS software applications is challenging enough, but most libraries' first foremost geospatial endeavor is to provide access to geospatial datasets. This often requires technologies beyond base GIS applications, such as RDMS, scripting/programming, and web development. How should data be collected and locally stored? How does the selection of data storage medium affect access? CD-ROM -- If data is stored on CDs, where will the CDs be stored? As a reserve item at the circulation desk? At the reference desk? These locations are usually not near GIS-enabled computers. OK, then how about right in the GIS lab (if the library has one.)? Other issues arise due to staffing (what hours will staff be there to check out the CDs? ), security, etc. Server (Data Download)--- On the surface, this approach has numerous advantages over CDs, but new and ever more complex issues arise. Of course, server space is needed. Licensing becomes an issue as single-user CD products can not be made available to multiple simultaneous users over a network (without vendor permission). Authentication becomes an issue. Should you require authentication to pass through the library's proxy server? Should off-campus users be able to access the data? Server (Web Services) -- Products such as ESRI ArcIMS and ArcSDE can be a fantastic way to provide access to geospatial data to multiple users. Always bear in mind the licensing constraints discussed above, however. You don't want a vendor to make an example out of your library. Very messy and embarrassing, I assure you. Creating web services that can be pulled directly into GIS clients is extremely handy for users, but can authentication be enforced? It would be easy to limit access to specific computers, but what if your institution has an educational site license for ESRI software? It becomes a challenge to maintain a database of GIS computers. You can limit access to the university IP domain, but the security risks become greater and greater. Furthermore, there is an access distinction that must be made between ArcSDE and ArcIMS. ArcSDE allows multiple users to access data across the network with potentially the same functionality they have with locally downloaded datasets. ArcIMS allows image services to be streamed, but with severely limited functionality. They can look at it, but not download it or touch it. ArcIMS also has feature services with similar limitations, but the data is downloadable. However, this is limited strictly to vector data. And, well, if the users must download the data in order to use it effectively, then setting up an ArcIMS server might not be worth the effort. Also remember that these options take a real, full-time, commitment. A dedicated server is often the best way to go and this costs money. Then there is training on installing and using these products effectively. Someone must build these activities into their job responsibilities. Should it be the GIS librarian? IT staff? A new employee? At UT Arlington, we are currently using Citrix server technology to serve our CD data. Citrix is fantastic in that it allows us to serve data and/or applications without installing the application on the client computer, while limiting the number of simultaneous users. Anyone on campus can now access most of our spatial data collection, regardless of licensing and format, as long as the Citrix client has been downloaded and installed (3mb free download). Almost all of the vendors gave us permission to serve the CD products via Citrix, as long as we can limit access to the UTA domain (which is easy enough to do) and limit access to one simultaneous user. Stats & Numbers...So, you thought you were just learning how to join tables and help folks make some pretty maps, eh? Rarely does someone need to make a simple map by joining features to a pre-created table to create a thematic map. This does indeed happen, but most times users need to use the GIS to answer questions that require some level of analysis and sophistication. Common examples include site selection, regression/correlation, ESDA, interpolation, and all sorts of other statistical goodies that a fear of math will prohibit a librarian from mastering. It is very common to use various statistical packages in conjunction with the traditional GIS applications. Some of the more popular include GeoDa, SPSS, SAS, and The R Project. The geospatial industry is accelerating so quickly that it really takes a full-time job just to keep track. Now, of course it is not necessary to keep track of every industry change and shift, but it is necessary to keep up with new technologies, products,and techniques as much as is humanly possible. If you do not, the struggle to get caught up will become a harder and harder struggle. When students who seek your assistance know more about GIS than you do, the value of the public services aspect of your position become horribly diminished. So, how can you keep up? There are quite a number of blogs, communities, and lists out there that you can pull into your feed aggregators. Two must-see websites are Slashgeo: In+ersec+tio for Spatial People and Planet Geospatial. There are also quite a few GIS-related journals out there to monitor as well. Thank goodness they do not publish as frequently as blogs and Ingenta provides free RSS feeds. Here is a list of the GIS-related publications that I monitor. Also try to take advantage of any training opportunities that you can. You can never, ever, know enough. I have worked as a political science librarian and a government documents librarian, and most professional development endeavors helped to set big-picture goals and strategies. For the first time in my career, my professional development is helping to define how I operate on a day-to-day basis. Definitions of service must be constantly be reexamined as capabilities and needs expand. As specified above, the fast development pace of the geospatial industry requires constant training and professional development. This, combined with a healthy dose of intellectual curiosity, will constantly increase the capabilities of a GIS Librarian. This will in turn require a regular inspection of the types and level of GIS services offered. At first, many libraries seek to provide access to a few basic GIS datasets and provide minimal assistance to access and make use of these datasets. As competencies increase, levels of assistance might likewise increase. As knowledge of the various types of web services (WMS, ArcIMS) increase, alternative means of providing access to datasets need to be considered. As the popularity of the GIS services grow, the allocated budget for commercial datasets will grow, allowing the scope of the library's holdings to likewise grow. As this simple progression implies, it is vitally important to keep goals, objectives, and scope of the GIS services offered by the library as flexible as possible. The interdisciplinary nature of GIS sets this subject specialty apart from traditional subject areas, such as history, business, literature, etc. The GIS subject specialist often acts as much more of a coordinator of GIS-related library services. Commercial datasets often are most often purchased by acquisition departments, who (1) might not know enough about the field to select materials on their own, and (2) usually have a severe dislike for CD products. Procedures and policies for handling geospatial data purchased on CDs might have to be drafted. All acquired datasets must be cataloged, usually in MARC and possibly FGDC metadata. The hardware and possibly server must be fully supported by IT departments, who will find that a lab or classroom of fully-functional GIS workstation will be much more work than any other configuration in the library. (The full ArcInfo installation is 3 CDs by itself). It will be necessary for continued outreach focused on various departments on campus, and so the appropriate liaison librarians will need to be consulted. One of the most common ways that libraries handle the necessity to marshal various library resources to support GIS services is to form geospatial data committees, teams, or working groups. This is the best solution as the responsibilities then become established into the normal working routines of the committee members. Metadata, metadata, and more metadata. So, you've decided to begin collecting geospatial data. Numerous questions must be considered concerning the catalog records. Will you create FGDC metadata records and/or MARC records? MARC is not designed to handle geospatial datasets, but there is a crosswalk. Who will create the records? A traditional cataloger will need some training to understand how to create FGDC metadata records. There are a number of free tools to help generate the metadata, as well as ArcCatalog. How will users browse and/or search through these records? Will you create a searchable metadata catalog? Always remember that records will need to be updated as data storage mediums (above) change. Have no doubts that you are embarking on an exciting career field, and one that I believe represents the types of public services librarians will be providing in the future. Yesterday, two urban planning students came to the library for advice about where to obtain appropriate datasets to run a gravity model ("predicts the sales potential of an area based on distance, competition, attractiveness factors, and consumer spending") on the hotel industry in Austin, TX. Well, unbeknownst to them they were indeed in luck as occupancy and sales data for hotels are more readily available in Texas than most other industries. This is why the final project in my advanced real estate market analysis course (syllabus: Flash) is a comprehensive market analysis of the hotel industry in the DFW Metroplex. Here is a list of free and library-acquired datasets that I am helping the urban planning students to integrate into their analysis. (These are in addition to the standard GIS layers they will need). This fantastic resource provides quarterly tax and sales data, by establishment, for hotel occupancy tax receipts, new franchise taxpayers, new sales tax permits, and mixed beverage tax receipts. I first discovered this incredibly open resource (especially for Texas) for a workshop I held last February, called 'Get the Most Out of a Retail Location: Maximize Mixed Drink Sales'. This workshop demonstrates how GIS can be used to provide a spatial dimension to multivariate regression analysis. The workshop documents can be downloaded here. Provides the number of establishments by establishment size by zip code. The industry code for hotels is '721110'. This historical (yes, 2000 demographics are now historical) dataset provides block group-level data from the long form of the U.S. decennial census for 1990 and 2000. This InfoUSA product, available at many libraries, provides downloadable lists of business and residential establishments. The downloaded tables contain a geocodable address field and even contain geocoded lat/long fields if you do not wish to do the geocoding yourself. Provides 2005 estimates on the block group-level for demographics, consumer expenditures, business and employee counts, personal finance, crime risk, and environmental risks. Christine GIS System 2.01 was just released. When students have light-weight GIS work (joining Census tables to shapefiles, for example) they need to complete for non-academic purposes, I almost always recommend the freely available (freeware) GIS Christine Viewer. Our educational license for ESRI software prohibit non-academic use of ArcGIS. I have been hesitant, however, to point out the shareware version, called Christine GIS System, as the capabilities did not seem worth the money. Late March, they released version 2.01 which really impresses me. It can create buffers, work with cad files, connect to WMS files, and is very scriptable. The one feature that I would really like to see is geocoding support. However, with resources out there such as Batch Geocode, this is manageable. Should the shareware version of Christine offer geocoding support, this would become one heck of cheap, small, GIS app. "3 in 10 households experiencing any type of identity theft discovered it by missing money or noticing unfamiliar charges on an account; almost 1 in 4 were contacted by a credit bureau." That's 3 out of 10!!! Red polygons are those areas that meet all 3 requirements listed above. Green polygons are urban areas where the median income is higher than $75,000. Blue polygons are urban areas where there is a large concentration of households headed by those in ages 18 - 24. Red pushpins are provided for the areas most at risk. Of course, this map was generated using ArcMap2GMap. So, I am trying out Google's new 'Google Related Links' service on this blog (bottom of right-hand menu) and I like the idea. Related news, searches, and links (pick 2) are dynamically generated. At this moment, in the 'news' category, there is only a single link to an available job from the Directions Magazine: Job Listings. Starting this Summer, our library will begin experimenting with topical discussion boards that anyone on campus (and possible off) will be able to participate in. The idea is that this will help to increase scholarly communication (and information literacy) among students, staff, and faculty, and therefore bring us all together. Well, the initial pilot project will be a GIS-topic discussion board. I think this will be fantastic. Presently, any student not taking a GIS course who wants assistance has only one place to turn to...the library. Now, this is great as it is my job responsibility to provide such assistance. But when I sit back and think of students helping other students, well let me tell you it almost brings a tear to my eye. Seriously. Currently, information regarding GIS news/activities is sent out via the GIS@listserv.uta.edu list. For the life of me, I cannot convince students to subscribe. Most subscribers are faculty and staff with an interest in GIS. I am of the belief that this is not unique and that student participation in traditional university-run email listservs are low. Therefore, I am convinced that student participation will be so much higher if we change the medium to a discussion board system with public rss feeds. I know this is improbable, but I like to daydream about one day sending information about a spatial dataset we (the library) are interested in acquiring and hearing immediate and widespread student feedback. We shall see, eh? "...help build the next generation of the National Biological Information Infrastructure (NBII)." Now, how could any librarian with an interest in the life sciences not want in on that? Unfamiliar with the NBII? Check out their website. U.S. federal agency that provides access to a wealth of biological information, including secondary publications as well as datasets. "Standardizing and providing information content on national plans, priorities, spatial and temporal information on the components of biological diversity." "Development of website and portal areas for the NBII." Now, this position "requires" an MLS and "desires" GIS experience. As I stated earlier, IMHO this is indeed the best way to go for many libraries.